For our second go at the Daring Kitchen challenge, Jen from use real butter challenged us to create homemade Chinese-style dumplings. The rules this time around: create a filling for the dumpling, make the wrapper, fill it up, and turn it into a beautiful dumpling; the last part proved to be the hardest. For my dumplings, I chose to make a pork filling and a shrimp and tofu filling. I varied the recipes a little bit but kept with the overall theme of the recipes; I didn’t do anything illegal and no, I didn’t cheat! As suggested by the recipe, I doubled the wrapper recipe to accommodate for all of the extra filling. For the two pounds or so of filling I made, the double recipe was just enough to use up all of the filling but I probably could have used a few more wrappers at the end. Wrapping the dumplings proved to be a bit more difficult than expected. This is only the second time I’ve ever made dumplings and the first time I attempted pleating the dumplings. It took me a few tries to get the general idea down and about and half of a recipe of dough to get consistent making them. Brimming with confidence, I switched gears and changed shapes from to more of a shumai style dumpling. Again, this took a few disasters before I got into the groove. Overall I’d say the dumplings came out successful. The early ones were a bit ugly but by the time I was done, I was getting more consistent and more confident. The only real downer for me was I didn’t spice up the filling enough and they were a little bit bland. I’m sure if when I make dumplings again, it will be corrected. Note: you will want to double this for the amount of filling listed – I just tend to use leftover pork filling for soup meatballs. 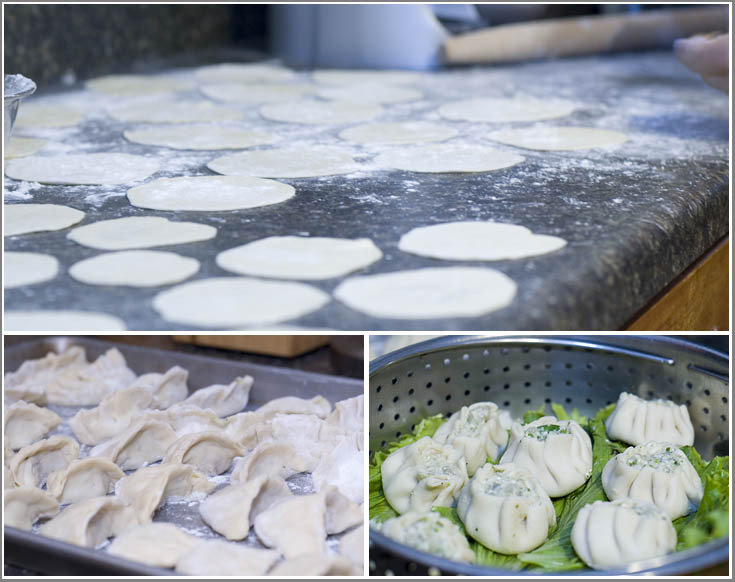 A single batch will yield about 40 dumplings depending on size. Combine all filling ingredients in a large mixing bowl and mix thoroughly (I mix by clean hand). Cover and refrigerate until ready to use. Both dough methods: Knead the dough about twenty strokes then cover with a damp towel for 15 minutes. Take the dough and form a flattened dome. Cut into strips about 1 1/2 to 2 inches wide. Shape the strips into rounded long cylinders. On a floured surface, cut the strips into 3/4 inch pieces. Press palm down on each piece to form a flat circle (you can shape the corners in with your fingers). With a rolling pin, roll out a circular wrapper from each flat disc. Take care not to roll out too thin or the dumplings will break during cooking. Leave the centers slightly thicker than the edges. Place a tablespoon of filling in the center of each wrapper and fold the dough in half, pleating the edges along one side (see images above). To steam: Place dumplings on a single layer of napa cabbage leaves or on a well-greased surface and steam for about 6 minutes. To pan fry (potstickers): Place dumplings in a frying pan with 2-3 tbsp of vegetable oil. Heat on high and fry for a few minutes until bottoms are golden. Add 1/2 cup water and cover. Cook until the water has boiled away and then uncover and reduce heat to medium or medium low. Let the dumplings cook for another 2 minutes then remove from heat and serve. To freeze: Assemble dumplings on a baking sheet so they are not touching. Freeze for 20-30 minutes until dumplings are no longer soft. Place in ziploc bag and freeze for up to a couple of months. Prepare per the above instructions, but allow extra time to ensure the filling is thoroughly cooked. 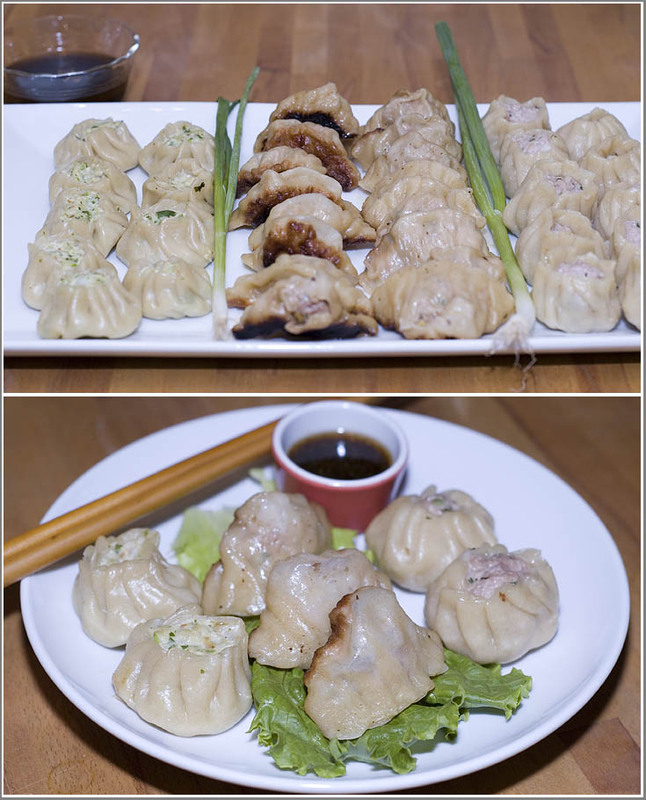 To serve: Serve dumplings or potstickers hot with your choice of dipping sauce combinations. Oh boy, I am loving your countertops 🙂 You made some great looking dumplings/potstickers there. Just lovely! Good job on the challenge. The beggars purses are super cute! Bravo what excellent pixs you have and two kinds of pleating and the colour on the potstickers is superb. Wonderful work on this challenge. Cheers from Audax in Australia. I love the picture of the wrappers on the benchtop very elegant. Great post! I’m hungry. And I want dumplings. Mmm … pork.